Why My Fit is Not Converged? Nonlinear least squares data fitting (nonlinear regression) can be performed using Fit Plot. 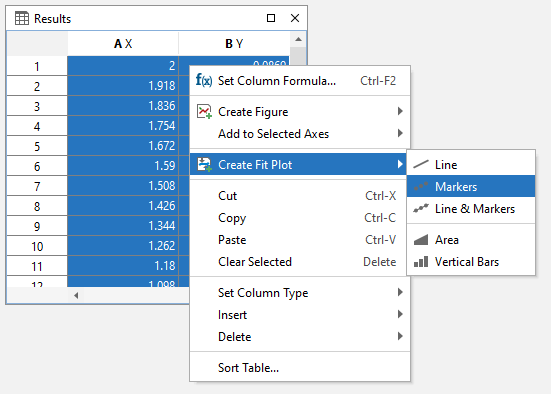 To create a Fit Plot, select your X and Y columns in Table, then select Table → Create Fit Plot in main menu, or use the same item in Table context menu, or use Create Fit Plot button in the toolbar. National Institute of Standards and Technology (NIST) has created Statistical Reference Datasets Project which includes 26 datasets for testing the nonlinear fit algorithms. MagicPlot has been successfully tested on these datasets. Our report on MagicPlot testing with NIST datasets is available here: Report. 'Nonlinear' means here that analytical fitting function depends nonlinearly on varying parameters (fit parameters). Fit procedure iteratively varies the parameters of fit function to minimize the residual sum of squares. Nonlinear fitting algorithm needs the user to set the initial values of fit parameters. You can undo fit and also undo changing initial parameters as any other action using Undo function. It is a handy feature when experimenting with different models and initial parameters. H. Motulsky and A. Christopoulos, Fitting Models to Biological Data Using Linear and Nonlinear Regression: A Practical Guide to Curve Fitting. 2003, GraphPad Software Inc., San Diego CA, graphpad.com. PDF is available for free here. MagicPlot considers fit function as a sum of Fit Curves. Ordinarily in peaks fitting each Fit Curve corresponds to one peak in experimental data. Click the Add button to add new Fit Curve to the list. There is a number of predefined Fit Curves types (Line, Parabola, Gauss, Lorentz, etc.) You can also create a Custom Equation Fit Curve and manually enter the formula (Pro edition only). Baseline fitting components may be added to the fitting sum, too. Below the Fit Curves list is a parameters table which shows names, values, and descriptions of parameters relating to selected Fit Curve. Fit by Sum button will fit the data with the sum of Fit Curves for which the Sum checkbox is set. Data interval from Fit Interval tab will be used. This button must be used for example to fit the spectrum with the sum of peaks. Fit One Curve button will fit the data with the one currently selected Fit Curve. Individual interval for each Fit Curve will be used. Set Edit Interval checkbox to edit individual interval for each Fit Curve. You can copy and paste Fit Curves from one Fit Plot to another Fit Plot or Figure. You can also paste the copied Fit Curves to the same Fit Plot to create a copy. The copy of Fit Curves with the same parameters and styles will be created if you paste Fit Curves to a Fit Plot. A link to the source Fit Curves will be inserted if you paste Fit Curves in a Figure. You can reorder Fit Curves by dragging them in table. The data curve is always drawn the first and fit sum is drawn the last. Nonlinear fitting assumes that certain initial values of parameters are set before fitting. This procedure is very easy if you use Fit Curves of predefined types (not custom equation): you can drag curves on plot. Initial parameters values for each Fit Curve can also be set in parameter table. If you are fitting a spectrum with multiple peaks, MagicPlot may automatically add and approximately locate peaks before fitting (Pro edition only). See Guessing Peaks (Pro edition only) for details. Guessed peaks should be used only as the initial estimate for fitting. You can lock (fix) parameter(s) to prevent varying this parameter(s) during fit and to prevent its changing due to setting initial values by mouse dragging (for built-in functions). Set the checkbox in Lock column in parameters list to lock parameter. 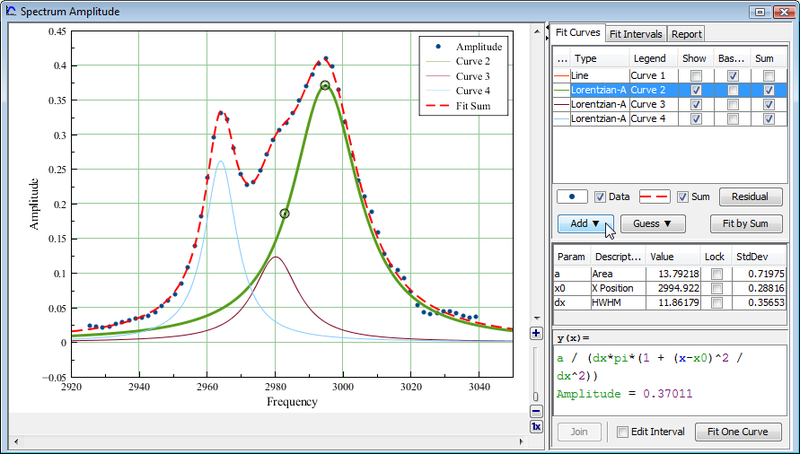 MagicPlot allows joining (sometimes referred to as coupling, binding, linking) of fit parameters of different Fit Curves. See Joining the Parameters of Fit Curves for details. MagicPlot allows data points weighting with Y error data. You can specify Y error data in Fit Plot properties dialog. If no Y error data are specified weighting is not used. Weights are calculated as 1 / Yerror2 for every point. See Fitting Algorithm and Computational Formulas for details. Weights must be positive and finite for all points so the Y error values must be positive and non-zero (to prevent infinite weights). MagicPlot checks this condition before fitting and shows an error message if Y errors cannot be used to compute weights. You can set the X intervals of the data which will be used for fitting. Data points outside these intervals are not used to compute the minimizing residual sum of squares. You can use this feature if some data points (especially in the beginning or the end) are inaccurate, e.g. noisy. Select Fit Interval tab to set intervals visually or edit accurate borders values in table. Note: Data intervals from Fit Interval tab are used for fitting Sum only. To set individual data intervals for the one Curve fitting use Edit Interval checkbox. Fit Interval is also usable when baseline fitting. Before baseline fitting you can specify the interval which does not contain any signal points and contains baseline only. Set Baseline checkboxes at baseline Fit Curves after baseline fitting to subtract baseline from data. Then specify the whole interval and fit the data. Note that if you use data processing (integration, FFT, etc.) on Fit Plot, then the difference between the data and baseline curves (which you do see on the plot) will be processed. You can use this behaviour to exclude baseline from data before integrating, see Integration (Pro edition only) for more information. The 'Data-Baseline' column is appended to the Table with initial (X and Y) data when you create a Fit Plot. The 'Data-Baseline' column contains the difference between initial Y data and baseline approximation (the sum of Fit Curves for which Baseline checkbox is set). It is 'Data-Baseline' column that is actually plotted on Fit Plot as data. Use 'Data-Baseline' column in Table if you want to process the data without baseline. This column is also used as initial data if you use Processing menu when Fit Plot is active. Press and hold the Residual button. The residual will be shown while button is pressed. You can use either mouse or space key (if button is selected) to hold Residual button. To execute the fit click the Fit by Sum button of Fit One Curve button (see below). MagicPlot indicates fit process with a special window. 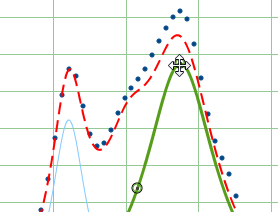 Fitting curves are periodically updated on plot while fitting so you can see how fit converges. MagicPlot shows current iteration number and deviation decrement with two progress bars while fit is performed. The fit process stops when one of these progress bars reaches the end. Break Iterations: Breaks iterations after current iteration. Use this button if you suspect that further iterations will not change the result. 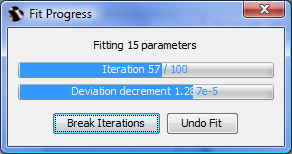 Undo Fit: Breaks iterations and reverts fit parameters to their initial (before fit) values. Use this button if you see that fit process converges to wrong result; change initial values of parameters and run fit again. You can use MagicPlot to fit the data with single selected Fit Curve by pressing Fit One Curve button. In this case a specific data interval for each Fit Curve is used and the main fitting data interval (from Fit Interval tab) is ignored. 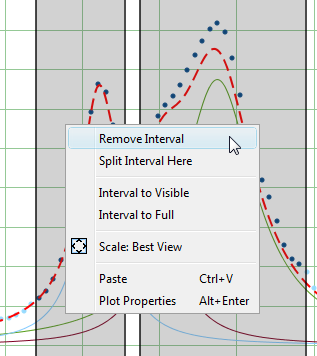 Select Edit Interval checkbox in the bottom of the Fit Plot panel to set specific fit intervals for each Fit Curve. Because of using individual data interval this method is useful for baseline fitting. In order to fit baseline specify the intervals which does not contain signal (peaks) and contain only noise. In some cases the fit procedure may fail to find the optimal parameters values. The actual mathematical reason for this error is impossibility to invert the matrix α calculated from partial derivatives of fit function with respect to fit parameters. This inverted matrix is used to compute the new values of parameters for next step of fit (like gradient descent). In most cases this error occurs when the matrix α is ill-conditioned or nearly singular and the inverse cannot be calculated accurately enough with used floating-point arithmetic. Fit is not converged through one or more parameters: some parameters were taking unrealistically great values during iterations. There are no local minimum of residual sum of squares near the initial values of these parameters. MagicPlot highlights the suspicious Fit Curve in this case. Mutual dependency exists between some parameters. The algorithm cannot resolve which parameter to vary. Fit function is ill-conditioned: the minimized residual sum of squares depends on some parameters much more than on other ones. Numeric overflow (or underflow) when calculating fit function with initial parameter values or on the next steps. Specify more accurate initial values of parameters. Simplify the fit function (e.g. remove some peaks).